Back to School is just around the corner and I wanted to share this craft project with you guys. If you have a sewing machine and can sew a straight line, you can totally make this fun Capri Sun Bag! I do not pretend to be a seamstress, or know how to sew anything but a straight line. Straight lines can get you pretty far in the world of sewing if you ask me, or my family. So far straight lines have gotten us pillows, curtain panels, and several crafts in between. *Disclaimer* I do not pretend to be a seamstress or know how to sew anything but a straight line. Straight lines can get you pretty far in the world of sewing if you ask me, or my family. So far straight lines have gotten us pillows, curtain panels, and several crafts in between. This time my straight lines made a grocery bag. Not just an ordinary grocery bag. A grocery bag made out of Capri Sun Pouches; empty of course! 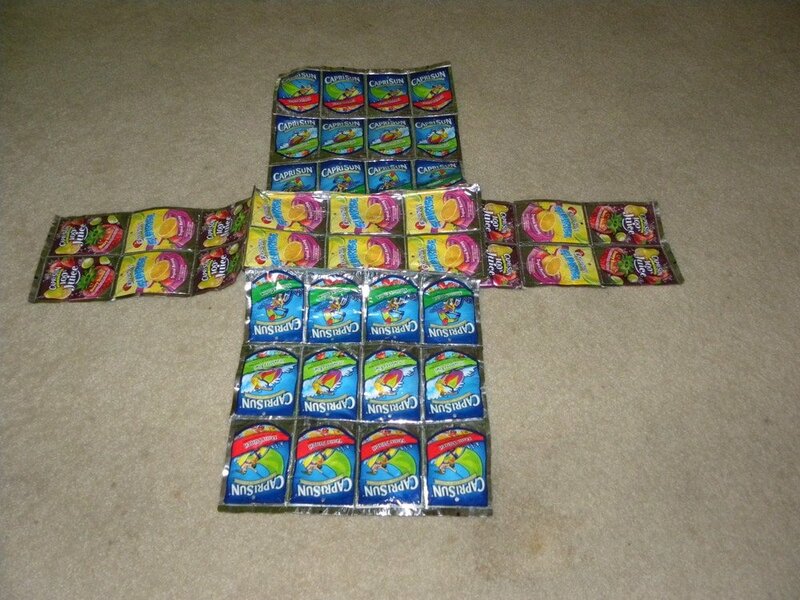 Did you know that you can not recycle a juice pouch? They just sit in a landfill somewhere. Since I am trying to teach my crew not to be wasteful, we are re-purposing those pouches into a nifty grocery bag. Now, not only did we save pouches from a landfill, but we won’t need to use the bags from the store! Did I mention that it is super cute too? The best way to make sure the pouches have been thoroughly cleaned is to make a slit it the bottom and wash with dish soap! Then, Start by sewing two pouches together. Overlap them just slightly and do a zig zag stitch the whole way down. This is how you will sew all of the pouches together. It is super simple. I used this as a lesson to teach my daughter how to use the sewing machine. You can see all of the pieces above! All you have to do is pin the 1″-2″ wide ribbon to the inside of the front and back panels. Stitch in a square pattern to hold in place securely. Back to what I did! Once the handles are attached you will sew the sides together! This is simple. That is it you should now have a finished Capri Sun Bag! So far I have heard the following perks to making my bag! So, start saving those pouches from the lunch boxes and make your grocery bag! I borrowed this post from you. I love this idea. Now since I have no sewing machine…wonder if a WONDERFUL reader would make one for me? Thank you for the great idea. We joined the juice pouch brigade at Terracycle. Check it out and keep all of the pouches you don’t use for crafts out of the landfill. Bonus: they donate to the charity of your choice. When I was younger a friend of mine made these but she made them much smaller (purse size) and sewed a thin feather boa on top. All the little girls just HAD to have a Capri Sun purse! It was cute. That is a really neat idea… Hope you dont mind if I borrow it from you to share! Made this with my 5-year-old over the Thanksgiving weekend. It was so fun! I wasn’t worried about crooked lines or funky stitching so I allowed him to do most of the sewing with little assistance. I did take over when it was time to sew the sides together just because it was more bulky and awkward. The bag is really fun looking. can’t say how durable it is yet. I ‘ll have to post again in 6 months. Thanks for the idea! A great repurposed handmade project to do! love it!